The final game was a 74-minute slugfest, and it was anyone’s game up until the very end. 100 Thieves powered through a full five-game series today to end Clutch Gaming’s hot streak and advance to the NA LCS finals in Miami next week. You know what that means—Zaqueri “Aphromoo” Black will now face his old Rush Hour counterpart Yiliang “Doublelift” Peng in the NA LCS finals for the first time since the spring of 2016. To say today’s series between 100T and Clutch was close would be a massive understatement. The two teams traded blows, with 100T picking up the first and third wins, while Clutch took the second and fourth games. The pendulum swung back and forth as each team seemingly bested one another in the pregame drafts. One game, Clutch mid laner Fabian “Febiven” Diepstraten locked in his famous Azir. 100T jungler William “Meteos” Hartman dominated on Olaf for two rounds. Clutch support Nickolas “Hakuho” Surgent landed his main, Morgana, in the final game. 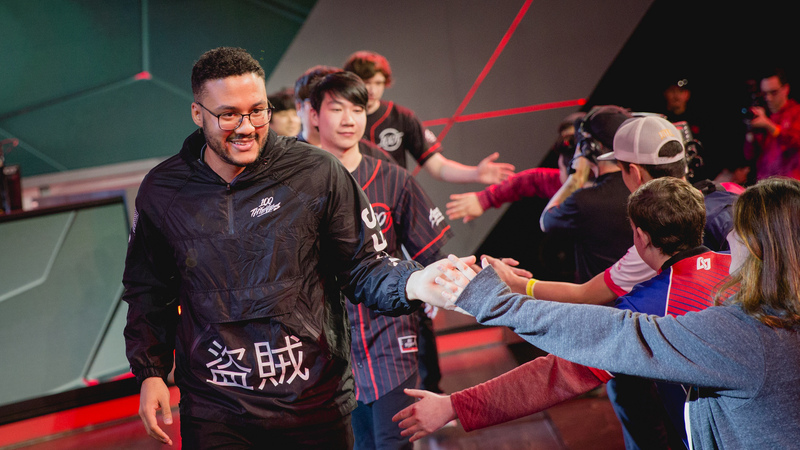 The featured matchup of the series was between superstar Aphromoo and Hakuho, who crushed TSM with Thresh in the quarterfinals. Oddly enough, however, neither one of them seemed to really carry their teams in any given round. It was Meteos and Clutch jungler Nam “LirA” Tae-yoo a couple of times, but for the most part, each game was a team effort. Baron was the name of the game in all five rounds. Wins were decided over which team could do the Baron dance the best, and in the final 74-minute game, 100T pulled off the can-can. They edged around Clutch, who were well-known for their ability to bait enemy teams around the Baron pit. Both teams were slow to act and extremely cautious when approaching the pit, though. They knew that one mistake for the sought-after Baron buff could lead to their team’s elimination, and that’s probably why the match lasted as long as it did. The final showdown between Liquid and 100 Thieves is next Sunday in Miami at 3pm CT.